Kendall Yards continues to grow in its quest to woo more retailers and restaurants to its burgeoning commercial district, and more residents to its growing array of townhomes, condos, and apartments. Three major buildings will continue or commence construction this year, further enhancing the new urbanist oasis. Unfortunately, none of the three buildings will offer a strong mixed retail/residential component, but as the district continues to develop, we anticipate more of those types of projects to come on line. Read on for more on the projects anticipated in Kendall Yards for 2016. Urban village to rise on Spokane’s South Hill? Matthew Byrd of Cornerstone Property Advisors is marketing an urban village at Quail Run on Spokane’s South Hill. Early site clearing has gotten underway on the property, located near the intersection of 29th Avenue and Southeast Boulevard, and vertical construction could be in progress within a few weeks. 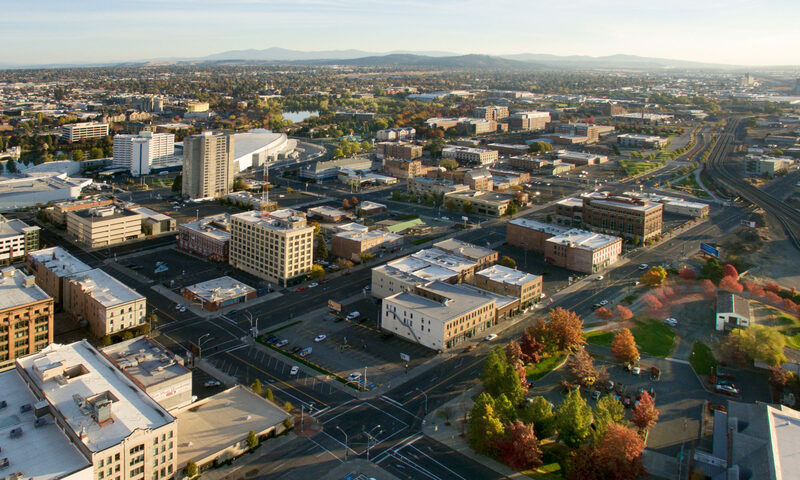 But as with all Spokane projects, it seems, this one has positive and negative aspects. Luckily, under all three scenarios, the majority of the new construction would be fronting a new “main street.” A water feature is envisioned in two of the three ideas. But one proposal in particular features a large anchor store and more extensive parking. And no specifics are given on whether any of the projects would be mixed-use, with residential features. For full project proposals, see the Quail Run website here. Hopefully the developers will construct a mixed-use urban village fitting of the next great American city. A project that will enhance quality of life and reap positive benefits not just for buyers of the development, but for neighbors as well. Residential in particular should be a critical component of any successful project. Time will tell, as construction is set to get underway soon. Construction is deep underway and should be nearing completion soon at the former Burgan’s Block site on the North Bank in the Division/Ruby corridor. Originally, the Burgan’s Furniture building and associated warehouses were set to be demolished and a five-story major hotel built in their place. That $10- to $20-million plan called for 90-100 suites and an adjacent events center complex with retail shops, restaurants, and even a rooftop garden. Instead, developer Jerry Dicker has crafted a more conservative approach, gutting the former Burgan’s Furniture buildings down to the walls and essentially starting over. The project, called Ruby Suites, will offer a 46 extended-stay hotel units, a fitness center, clubhouse, and three retail suites on the ground floor. It should make for an exciting project, although we can’t help but lament the absurd 136 parking spaces planned for the Ruby side of the block. Hopefully in the future, the site can be built out with underground or structured parking and even more residential units. What do you think? Are you excited about the redevelopment of the Burgan’s Block? Would you stay there if you needed an extended-stay residential option? Would you open a business there? And what of this continued revival of the North Bank/Division corridor as a major retail-residential node? Let us know in the comments below, on Facebook, on Twitter, or in person. We love to hear from you. We’ve also received word construction will begin next month on a 60-unit apartment complex set between the University District and downtown. A different 90-unit complex is expected to be built downtown starting in January 2015. Who’ll be building these units? And where? How? When? Who’s the contractor? The architect? KXLY’s story leaves us with little new information. We think we’ve nailed down the 60-unit complex “between the University District and downtown,” and though their story makes it seem like a project for the East End/West Main area, all indications are that it will be located on Ruby (near Chipotle). But we’ll bring you more on that tomorrow. The big news is the 90-unit development set “to be built downtown starting in January 2015.” Who are KXLY’s sources? What are they hearing? It could be anywhere, but considering the scale of some of the most recent major downtown apartment proposals, it could be as significant as 153 S Wall, a major downtown development by Prium Companies which was scuttled during the financial crisis but which originally sought to build 96 units. Time will tell, and we’ll keep you posted. What do you think? Are you excited for the addition of 150 units to the downtown or North Bank areas? Do you have any more information on either the 60-unit or the 90-unit projects set to start construction soon? Let us know in the comments, on Facebook, on Twitter, or in person. We love to hear from you.